Reader question: what's up with this squirrel's raggedy fur? This VA squirrel has white, gray and rusty fur at all different lengths and angles. Can you figure out what’s wrong? 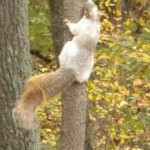 Keep reading Reader question: what’s up with this squirrel’s raggedy fur?